I was in Hitachi Seaside Park in Ibaraki, Japan. The sun was pouring its morning benediction, shining through towering trees interrupted by yellow blooms. My soul has always been attracted to flowers, like how they are attracted to sunlight. Yes, flowers are ephemeral, but there’s this inexplicable feeling when I am surrounded by them, like they take away all my fears, fleetingly. 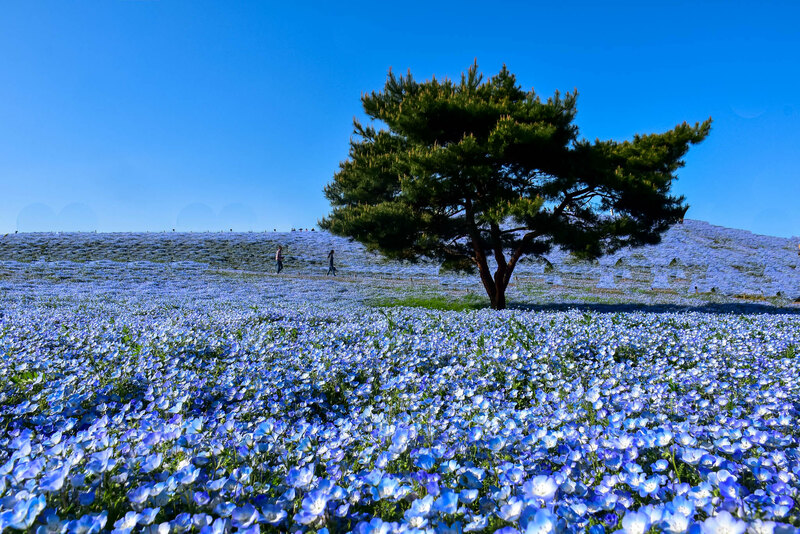 The photo of Miharashi Hill in Hitachi Seaside Park with blue nemophilas was the main reason we were there. But I first learned about Hitachi Seaside Park in Hitachinaka City in Ibaraki Prefecture, Japan while browsing my friend’s blog a few years ago. I still vividly remember that image of the chairs fringed by narcissus flowers taken by my friend. That photo alone made me wish that one day, at the right season, I will see that image too in real life. I had forgotten that dream, until recently, during our trip to Tokyo. When Jetstar invited us to Nagoya, we decided to extend our trip and take a night bus from Nagoya to Tokyo. So when we were planning our Tokyo itinerary, I made sure that we’ll make a sidetrip to Hitachi Seaside Park. 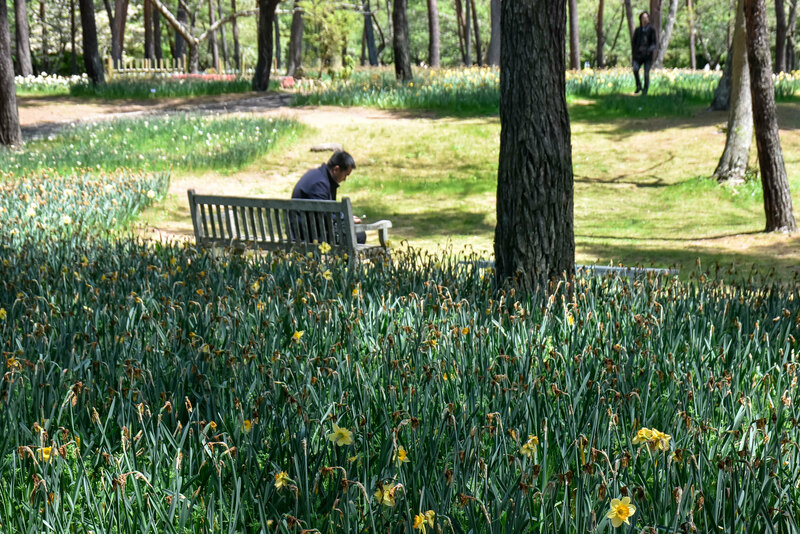 And as luck would have it, I found myself leisurely walking along Suisen Garden, where the pathway was surrounded by narcissus bloom in early May. My guide was no other than my good friend Vins of The Poor Traveler. The same person who wrote the Hitachi Seaside Park blog. Honestly though, the scene wasn’t as stunning as I saw on the pictures because many of the yellow flowers have wilted already, but I was ready for more surprises. And thankfully, Hitachi Seaside Park did not disappoint. 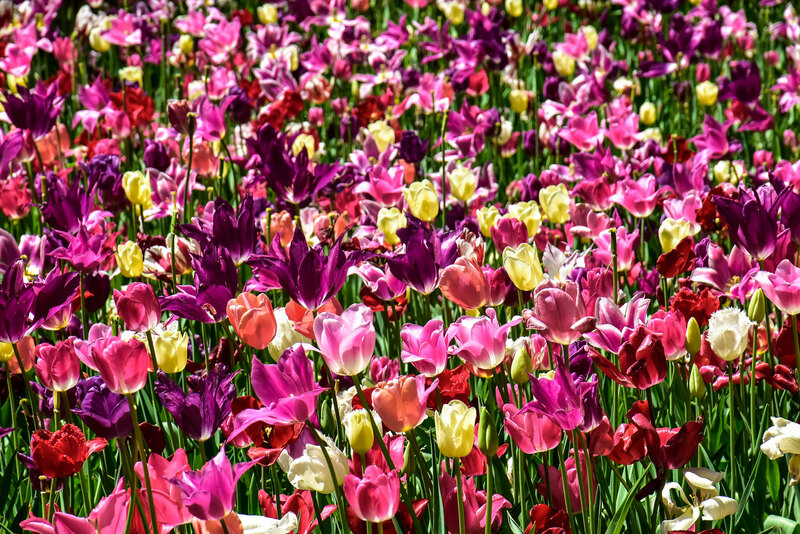 Go on a trip from Tokyo to Ibaraki Prefecture to enjoy endless seafood and flowers with an English, Chinese, or Japanese speaking guide! Enjoy a filling sushi lunch at Yamasa Seafood Restaurant, located in Nakaminato seafood market, with unlimited crab soup! From Yaseu South Entrance of Tokyo Station, take the Ibaraki Kotsu Highway Express Bus. One way bus fare is JPY 2,100 (PHP 959/ USD 19/SGD 26/ MYR 81) and roundtrip ticket is JPY 3,800 (PHP 1,734/USD 34/SGD 47/MYR 146). You need to pay additional JPY 200 (PHP 91/USD 2/ SGD 2/ MYR 8) at the bus though. Take note that Hitachi Seaside is not the last stop, it will continue to other destinations in Ibaraki. So make sure you inform the driver or listen to the announcement on the bus. Return trips to Tokyo stops at around 4:41 PM. So make sure you don’t miss that. Otherwise, you can take the bus to Katsuta Station and take the train back to Tokyo. See directions below. We took the train from Ueno Station when we went to Hitachi Seaside Park. You can purchase a JR Pass to get unlimited JR train rides. Option 1: So how do you go to Hitachi Seaside Park from Tokyo by train? From Ueno Station in central Tokyo, we took the JR Joban Line to Katsuta Station. Train fare is JPY 2,270 (USD 20/ PHP 1,030 /SGD 28/ MYR 87). Travel time is 2 hours, 17 minutes. Option 2: Alternatively, from Ueno Station, you can take a Limited Express Train. Train fare is JPY 3,820 (USD 34/ PHP 1,733 / SGD 47/ MYR 147). Travel time is 1 hour and 10 minutes. Upon exit at Katsuta Station, line up for buses going to Hitachi Seaside Park. Regular roundtrip fare is JPY 1,200 JPY 1,200 (PHP 548/ USD 11/ SGD 15/ MYR 46). Transit time is about 30 minutes. See bus fare table below. IMPORTANT: If you purchase the roundtrip bus fare from Katsuta Station to Hitachi Seaside Park for JPY 1,200 (PHP 548/ USD 11/ SGD 15/ MYR 46), it comes with 1 Day FREE ticket to Hitachi Seaside Park. So no need to pay the entrance fee. Make sure you keep your ticket as you need to show it upon entering the park and upon riding the return bus. Option 1: If you’re coming from Tokyo Station, to get to Hitachi Seaside Park, take the JR Utsunomiya Line for Ueno Station and then transfer to a Limited Express Train to Katsuta Station. Train fare is JPY 3,820 (USD 34/ PHP 1,733 / SGD 47/ MYR 147) and transit time is 1 hour and 17 minutes. Option 2: If you’re coming from Tokyo Station, you can also get to Hitachi Seaside Park by taking the JR Utsunomiya Line for Ueno Station and then transfer to a Limited Express Train to Katsuta Station. Transit time is 1 hour and 38 minutes. Train fare is JPY 3,820 (USD 34/ PHP 1,733 / SGD 47/ MYR 147). Once you exit at Katsuta Station, there’s a line for buses going to Hitachi Seaside Park. Regular roundtrip fare is JPY 1,200 JPY 1,200 (PHP 548/ USD 11/ SGD 15/ MYR 46). Travel time is about 30 minutes. See bus fare table below. IMPORTANT: If you buy the roundtrip bus fare from Katsuta Station to Hitachi Seaside Park for JPY 1,200 (PHP 548/ USD 11/ SGD 15/ MYR 46), it comes with 1 Day FREE entrance to Hitachi Seaside Park. Keep your ticket as you need to show it upon entering the park and upon riding the return bus. Option 1: If you’re coming from Shinagawa Station in Tokyo, you can ride the JR Toban Line to Tsuchuria Station and then transfer to the train bound for Takahagi. Alight at Katsuta Train Station. 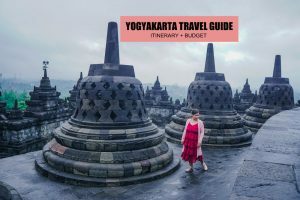 Train fare is JPY 2,270 (USD 20/ PHP 1,030 /SGD 28/ MYR 87) and travel time is 2 hours and 43 minutes. Option 2: Alternatively, you can take a Limited Express Train to Katsuta Station. Fare is JPY 3,820 (USD 34/ PHP 1,733 / SGD 47/ MYR 147) and transit time is 1 hour and 26 minutes. At Katsuta Station exit, look for buses going to Hitachi Seaside Park. Regular roundtrip fare is JPY 1,200 JPY 1,200 (PHP 548/ USD 11/ SGD 15/ MYR 46) with free 1 Day ticket (entrance fee) to Hitachi Seaside Park. Transit time is about 30 minutes. See Bus fare table below. IMPORTANT: If you purchase the roundtrip bus fare from Katsuta Station to Hitachi Seaside Park for JPY 1,200 (PHP 548/ USD 11/ SGD 15/ MYR 46), entrance fee to Hitachi Seaside Park is FREE. Just keep your ticket because you need to show it upon entering the park and upon riding the return bus. Once you exit at Katsuta Station, there’s a line for buses going to Hitachi Seaside Park. Regular roundtrip fare is JPY 1,200 JPY 1,200 (PHP 548/ USD 11/ SGD 15/ MYR 46). Travel time is about 30 minutes. IMPORTANT: If you purchased the roundtrip bus fare from Katsuta Station to Hitachi Seaside Park for JPY 1,200 (PHP 548/ USD 11/ SGD 15/ MYR 46), it comes with 1 Day FREE ticket to Hitachi Seaside Park. So no need to pay the entrance fee. Make sure you keep your ticket as you need to show it upon entering the park and upon riding the return bus. If you want to see the blue nemophila and the tulips, visit around late April to early May. But avoid the Golden Week because it’s gonna be too crowded. 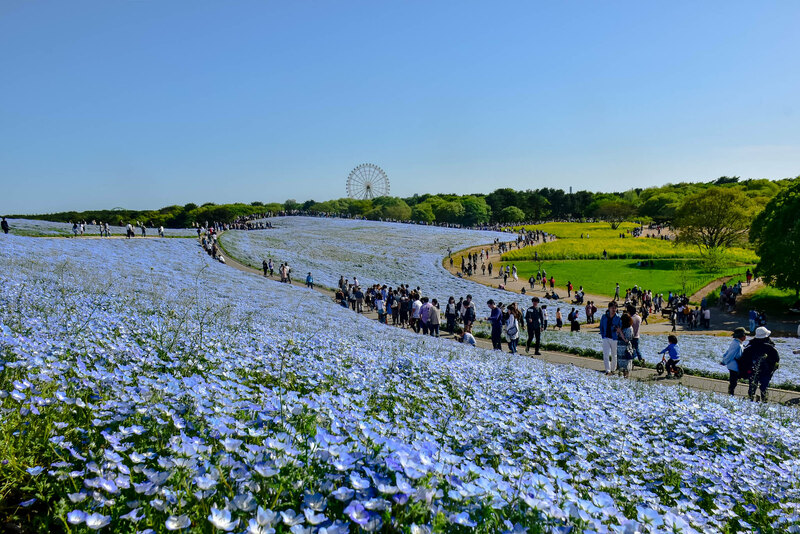 Hitachi Seaside Park is actually blooming year-round. If you visit around early January to mid-March, you’ll encounter a wealth of grapeseed flowers sprinkled around the park. 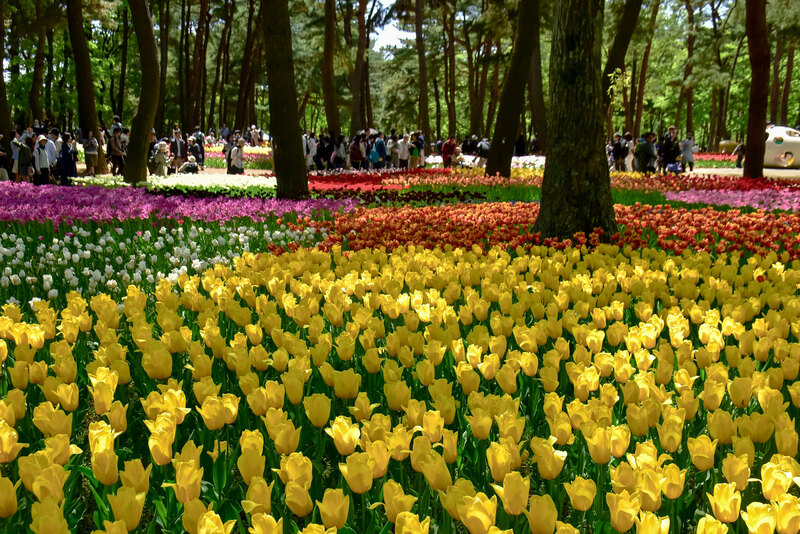 Come late March to mid-April, the best spot to visit is Suisen Garden for its narcissus bloom. 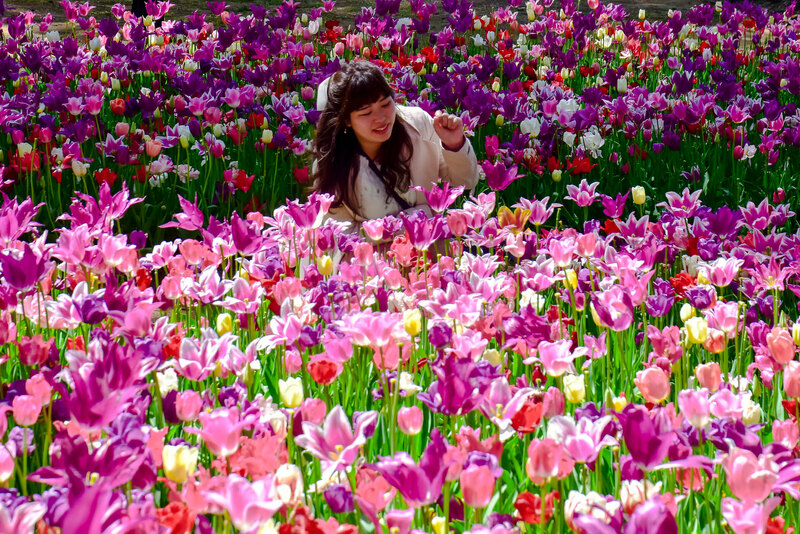 And by mid to late April, myriads of tulips are in bloom at Tamago no Mori. Late April to mid-May, the queen of all flowers – the blue nemophilas fill Miharashi Hill. Despite the crowd it brings, the moment is still magical. The ceaseless wind blows the fragile petals of the tiny indigo flowers as they gracefully sway to its rhythm. 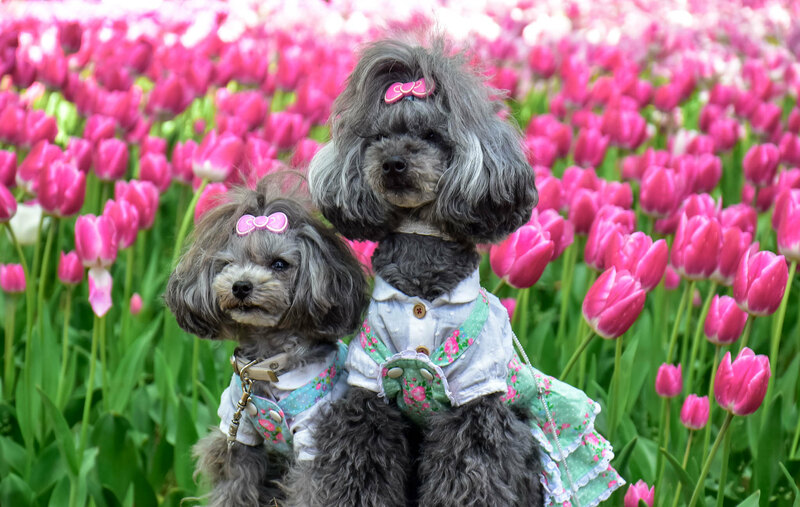 Early May to early June, the lovely poppy flowers blossom at Daisogen Flower Garden. And by mid-June, you’ll find oumegasaso scattered around Hitachinaka Nature Forest. Meanwhile, roses congregate around Hitachi Rose Garden by late May to early June and from early to mid-November. Around early July to early August, don’t miss the Sakyu Garden filled with sukashiyuri lily. Hitachi Seaside Park turns indigo by mid-July, as lavender bloom in Kaori no Tani. And by late July to mid-September, pink, red and orange zinnias clad the Miharashi no Sato. Pampa grass are all over Hitachi Seaside Park by early September. By mid-September to late October, cosmos fill the Daisogen Flower Garden. And by October, Hitachi Seaside Park turns red as Miharashi Hill is dominated by kochia. Early to late October, the Sakyu Garden is clad by Nippon daisies. 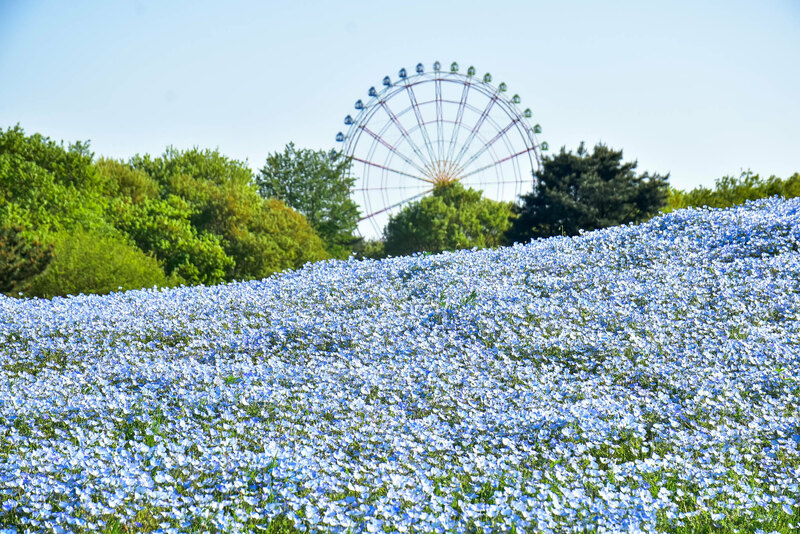 Aside from flower galore, Hitachi Seaside Park also features a small amusement park crowned by a 100 meter tall Ferris wheel. Tourists can also try the 25 rides here such as merry-go-round and roller coaster, but entrance fee is required for each ride. If you like biking, you’ll be glad to know that you can cycle around the sprawling park. Eating is not a problem in Hitachi Seaside Park as there are a couple of food trucks scattered around here, but the cheapest food can be found near Maharashi Hill as well as a vendo machine for drinks near the toilet. Home-made drinks are quite expensive if you buy from food trucks. 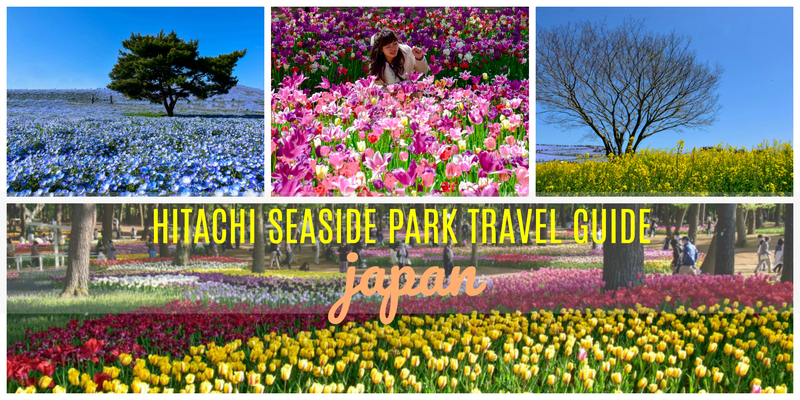 Here’s a sample itinerary for Hitachi Seaside Park day trip from Tokyo. Feel free to tweak it depending on your schedule and budget. 09:17 AM ETA Katsuta Station. Take exit and line up for bus to Hitachi Seaside Park. 09:30 AM JPY 1,200 (PHP 548/ USD 11/ SGD 15/ MYR 46) ETD For Hitachi Seaside Park. 10:00 AM ETA Hitachi Seaside Park. Pay entrance fee if you did not purchase the roundtrip ticket with free 1 day ticket to Hitachi Seaside Park. 03:30 PM JPY 2,270 (USD 20/ PHP 1,030 /SGD 28/ MYR 87). ETA Katsuta Station. Train back to Tokyo (Ueno Station). If you purchased the roundtrip bus fare from Katsuta Station to Hitachi Seaside Park for JPY 1,200 (PHP 548/ USD 11/ SGD 15/ MYR 46), it comes with 1 Day FREE ticket to Hitachi Seaside Park. So no need to pay the entrance fee. Make sure you keep your ticket as you need to show it upon entering the park and upon riding the return bus. There’s a vendo machine for drinks near the toilet entrance at Miharashi Hill. You can save a few bucks if you buy your water or drinks there. Avoid the Golden Week and other holidays as it can get too crowded. When in Japan, make sure you have Wi-Fi since you will most likely need to access Google Maps and Hperdia.com. You can rent a wi-fi router below and just pick it up at any International Airports in Japan. It’s the lowest rate I found so far. Hi! 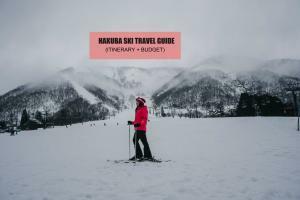 Glad to found your articel regarding the different route/transpo to Hitachi Seaside. May I know when did you go to Hitachi Seaside? 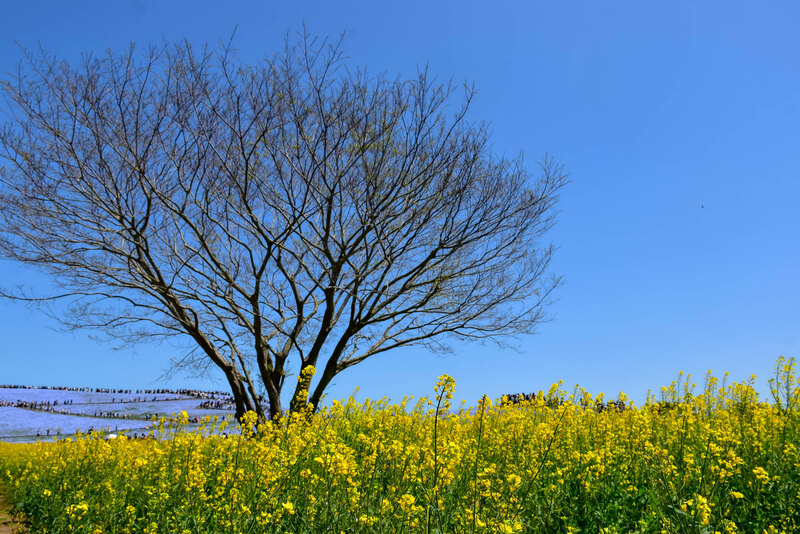 I’m planning to go by last week of April (timing for the nemophilias), but saw that it was the Golden Week holiday in Japan. Do you think 3rd week of April is still okay? Hi…from google map, the hill of Miharashi looks far from the main entrance. Are there any transport to go from the gate to the hill or around the place? or lakad lang talaga within the vicinity? thank you! Hi, it is a great post ! I just want to ask that inside the park, is it walkable? Thank you !